WOW!!! That video is so... just.... WOW!!! I went back and looked at your original post with the first pictures of poor little Hayat... and at your most recent picture of her... and then that video... I swear it made my eyes tear up... what an incredible and beautiful rescue story. Thank you! Thank you i get emotional too when i see the old hayat she is so sweet she trust me im so happy she got so healthy i defo gonna continue my mission to help birds in need hayat is my inspiration! How many babies now Amsterdam? Would love to a picture of them,they must have gotten so big already! They look healthy and strong, good color, good size too...And hatching right on-time!!! heres a picture of the 3 babys!! I think I'd give those other eggs a few more days. Who knows,maybe Hyatt will realize they aren't going to hatch and forget about them? I think after a few more days I'd remove them anyway. Hyatt and dad a pretty busy with t6he three babies and they might not even know the eggs missing. 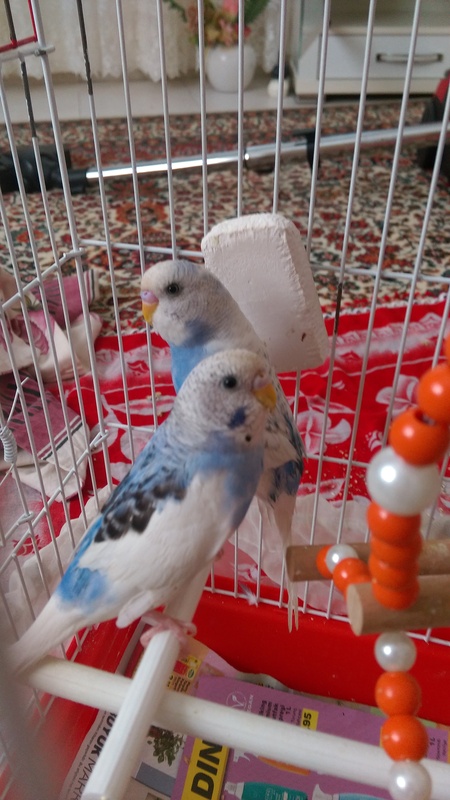 I'm sure others with more experience raising baby budgies will chime in. don't worry too much Amsterdam it looks like you and your birdies have it all under control as it is and BTW the babies and Hyatt are beautiful..well done! Many birds mess up the first (few) attempts. You really have a few special ones there. In a few days she will be SO busy feeding the little ones you could paint the nest purple and she would not care - so remove the unfertilized eggs in a week or so. You will not damage the relationship at all.